“NetBet 1 Million Game” is a sports prediction game, offered by NetBet. From 1st May until 10th June, you have the chance to win £1 million with NetBet by betting on the results of all of the games in the Euro 2016 taking place between 10th June and 10th July, 2016. You can participate in the “NetBet 1 Million Game” from 1st May to 10th June, 20:59. Any participation or change made after this date and time will be considered null and void. Each player can participate 3 times, by paying £1. Visit the NetBet 1 Million Game page on the NetBet site. You will be prompted to sign in first. Make your predictions in two stages; the Group Stage, where you guess which 16 teams qualify to the Knockout Stage, where teams are eliminated until the final two play for the title. The fewer incorrect predictions you make, the more money you take home! If your predictions include no errors or just one you will win the big £1 million prize, while 13 to 15 inaccuracies will let you earn £5000! New player can get a 50% first deposit bonus up to £50! Join Netbet get up to £50 in free bets! 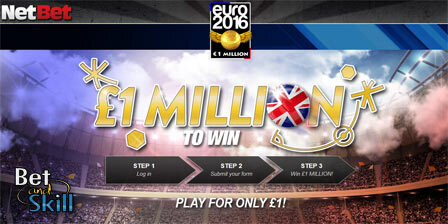 "Euro 2016 predictor game: win £1 Million at Netbet"